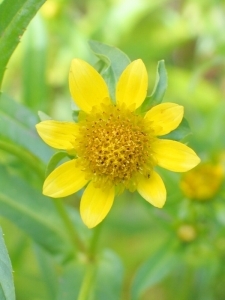 Bidens cernua (nodding beggar ticks) is a member of the Asteraceae or daisy family. The species is common in the Finger Lakes region of NY, where it blooms from late August to October. Since it is such a late blooming plant, I often wait in anticipation throughout the summer for the blossoms of this species to be displayed. There are numerous species of Bidens or beggar ticks that occur in central NY and they are all late blooming species. Bidens cernua is distinguished from most others that occur in central NY by having: ray flowers usually present and not obscure; mid-stem leaves without a stalk (sessile) and sometimes connate (opposite leaves with bases connected around the stem); and flower heads (capitula) that nod with age. Bidens laevis or showy beggar ticks is somewhat similar and specimens of B. cernua have been mistaken for B. laevis. Bidens laevis is distinguished by longer ray flowers (> 1.5 cm long vs. < 1.7 cm long for B. cernua); outer involucral bracts (bracts that subtend the capitula) shorter (up to as long as the disk of the capitula vs. longer than the disk for B. cernua); and chaff of the receptacle orange or reddish tipped (vs. yellow tipped for B. cernua) (Wiegand and Eames 1926, Fernald 1970). In addition, B. laevis is very local in central NY being confined to the Ontario Lake Plain (Wiegand and Eames 1926). Sherff and Alexander (1955) reduced to synonymy all but one (var. oligodonta) of the subspecific taxa that had been created for B. cernua. Sherff and Alexander (1955) state, "many attempts have been made to divide B. cernua into forms, subvarieties, varieties, and even species; but all these (with the apparent exception of var. oligodonta) vary so indiscriminately that the characters listed for one will elsewhere reappear in almost endless overlapping combinations with those of others, and the lines of demarcation disappear." Variety oligodonta is recognized by leaves commonly obtuse or rounded at the apex, the principal ones entire or dentate with 1-6 pairs of remote teeth (vs. leaves narrowed into elongately acuminate-attenuate tips, the principal ones sharply serrate with 4-24 pairs of teeth for var. cernua) and outer involucral bracts from oblong to spatulate in outline, obtuse or rounded at the apex (vs. outer involucral bracts linear to lanceolate in outline, acute or subacute at the apex for var. cernua) (Sherff and Alexander 1955). Most recent checklists and floras in eastern North America (Gleason and Cronquist 1991, Haines and Vining 1998, Rhoads and Block 2000, Weakly 2005) do not recognize any varieties under B. cernua. Bidens in general are often referred to as beggar ticks, bur marigold, or stick tights. 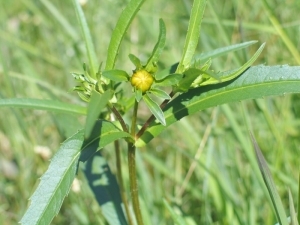 Various common names have been applied to B. cernua including stick-tight (Fernald 1970), stick-tights (Mitchell and Tucker 1987), nodding beggar ticks (Haines and Vining 1998, Weldy and Werier 2005), bur marigold (Haines and Vining 1998, Weakley 2005), and nodding bur-marigold (Stace 1997). Bidens cernua is a very widespread species considered to be native throughout the northern hemisphere including Asia, Europe, and North America (Sherff and Alexander 1955, Tutin 1976, Gleason and Cronquist 1991). In central New York it occurs in marshes, silty edges of ponds and streams, and wet ditches. It usually does not occur where the canopy cover is too dense. Bidens cernua is an annual. It grows 1-9 dm in height. The stem is without hairs or with rough hairs. The leaves are opposite, sessile (without a stalk), and irregularly toothed. The leaf bases are often connate (opposite leaves with bases connected around the stem). The inflorescence is composed of capitula or heads. These are erect when first in flower but eventually nod (hence the common and scientific name). Each capitulum is composed of numerous ray and disk flowers which occur on a common receptacle surrounded by two series of bracts (involucral bracts). There are 5-8 leafy outer involucral bracts that are longer than the disk. The inner bracts are translucent and do not exceed the length of the disk. Ray or ligulate flowers are often present and number 6-8. They are yellow and < 1.5 cm. long. The inner or disk flowers are 5 lobed at the summit and yellow. The receptacle is also covered with chaff that is yellow tipped. The mature achenes (fruits) have a convex cartilaginous apex and 4 barbed awns (Sherff and Alexander 1955, Fernald 1970). The barbed awns on the summit of the fruits help the plant disperse. In most cases this is probably via mammals although one study found the fruits being dispersed on the bodies of Jefferson/blue-spotted and yellow-spotted salamanders (Lowcock and Murphy 1990). In fact this study estimated that approximately 1000 fruits could have been transported by these salamanders in one spring season to a several hectare pond in Haliburton County, Ontario, Canada. In the Ukraine B. cernua is used medicinally for the prevention of skin rashes and as a diuretic and sudorific (Kuritz et al. 2000). 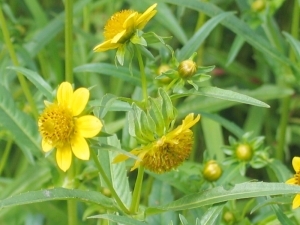 Recent research has isolated a chemical, cernuole, from Bidens cernua that has antimicrobial properties (Smirnov et al. 1995, 1998). While not the showiest of plants, B. cernua has beauty and is an interesting plant of the wetlands of central NY as well as most of the northern hemisphere. In order to get a good view you may need to get your feet wet but the extra effort is worth the experience of viewing up close the charm of Bidens cernua. Fernald, M.L. 1970. Gray's Manual of Botany. 8th edition. Corrected printing. D. Van Nostrand, NY, NY. Gleason, H.A. and A. Cronquist. 1991. Manual of Vascular Plants of Northeastern United States and Adjacent Canada. 2nd edition. The New York Botanical Garden, NY, NY. Haines, A. and T. F. Vining. 1998. Flora of Maine. V. F. Thomas Co., Bar Harbor, Maine. Lowcock, L. A. and R. W. Murphy. 1990. Seed dispersal via amphibian vectors: passive transport of bur-marigold, Bidens cernua, achenes by migrating salamanders, genus Ambystoma. The Canadian Field-Naturalist 104(2): 298-300. Mitchell, R. S. and G. C. Tucker. 1987. Revised Checklist of New York State Plants. Contributions to a Flora of New York State. Checklist IV. New York State Museum Bulletin No. 490. The University of the State of New York. The State Education Department, Albany, NY. Kuritz, T., L. A. Sirenko, T. V. Parshikova, L. Topchishvili, and A. Sass. 2000. Medicinal Plant Remedies and Nutraceuticals from Ukraine and Georgia. HerbalGram 51: 48-54. Rhoads A. F. and T.A. Block. 2000. The Plants of Pennsylvania. An Illustrated Manual. University of Pennsylvania Press, Philadelphia, PA.
Sherff E. E. and E. J. Alexander. 1955. Compositae-Heliantheae-Coreopsidinae North American Flora, Series II. 2: 1-190. Smirnov, V. V., L. A. Bakina, A. S. Bondarenko, G. T. Petrenko, and O. V. Evseenko. 1995. A new sesquiterpene phenol from Bidens cernua L. with antimicrobial activity. Rastitel'nye-Resursy 31(2): 31-37. Smirnov, V. V., A. S. Bondarenko, and V. A. Prikhodko. 1998. Antimicrobial activity of sesquiterpene phenol from Bidens cernua. Fitoterapia 69(1): 84-85. Stace, C. 1997. New Flora of the British Isles. 2nd edition. Cambridge University Press. Cambridge, United Kingdom. Tutin, T. G. 1976. Bidens L. Pages 38-39 in T. G. Tutin, V. H. Heywood, N. A. Burges, and D. H. Valentine (editors) Flora Europaea, Volume 4, Plantaginaceae to Compositae (and Rubiaceae). Cambridge University Press. Cambridge, United Kingdom. Weakley, A. 2005. Flora of the Carolinas, Virginia, and Georgia. Working draft as of June 2005. Unpublished. Available on the web at (http://www.herbarium.unc.edu/flora.htm).